Happy New Year! It’s 2014 and I’m sure you have already set your business objectives for the year. Have you set your blog objectives? What do you plan to achieve with your blog this year? Many people forget that blogging is a marketing tool. As with any marketing tool you want to be able to see and measure results. You can do this by setting blog objectives. 1. How often do you want to blog? If you have been blogging for a while now you have probably set a blogging schedule – daily (very ambitions), weekly, bi-weekly or monthly – or you blog whenever the mood strikes. A way to help with scheduling and planning blog post is to create an editorial calendar. Your editorial calendar can be as basic or as complex as your business or personality. My editorial calendar is a spreadsheet that includes columns for topic, title, meta title, meta description, keywords, categories, call to action, and date posted. Once you create your editorial calendar stick with it. It helps to keep you on track and makes you more aware that you have to set time aside on a regular basis to actually sit down and create a blog post. So your first objective is to create and stick to a blog schedule. Search Engine Optimize each post to drive traffic. You can see from above that meta title, and description are a part of my blogging process and that is because I use my blog to increase traffic to my website. Every week I review analytics to monitor traffic, traffic source and keywords used. This helps me determine which blog posts are effective and helps me plan future posts. It also shows me keywords people use to find my site that I also use in planning. And finally it enables me to set targets based on similar posts. Your second objective is to drive organic traffic using blog posts, which leads to the third objective driving social media traffic. Social Media is a big part of marketing today and you want to use it to the fullest. After publishing a blog post the next step would be to post it on social media. Post to all social media accounts and use images to help it go viral. Not only do you want to increase traffic from social media you also want to increase interaction. To see a big jump on interaction you can add social media sharing buttons to your blog posts. I use analytics with such tools as Hootsuite to see what blog posts are being shared, tweeted, commented on etc. I also look at which social media is driving the most traffic and interaction. These numbers help me to plan future blog posts as well tweaking my reposting to social media. I may repost a blog post with a different title, or image and measure the reaction. Your third objective is to increase traffic and interaction through social media. Use your blog posts to increase sales. If you noticed above in my blog process I include a call to action because at the end of the day when blogging for your business you want to be able to increase business. Each blog post has an objective that I include in my call to action. The objective may be as simple to comment, share on social media, or a bit more specific such as download a free report or to buy something etc. Even if the call to action is as simple as to comment my ultimate goal is to gather leads and prospect to increase sales. Not only should you use a call to action in your blog post, you should also be linking to your products and services when applicable. Your fourth objective is to increase sales by having a blog post objective, a call to action and internal links to your products and services. Based on the 4 main objectives above (feel free to add more to align with your business objectives), the next step is to measure success. Take a look at last years numbers. What were your weekly, monthly, and quarterly organic traffic, what were the traffic sources, what was social media interaction and blog interaction like? For example one week of traffic I had 400 unique visits, 20% from Facebook, 20% from Twitter, 20% from other social media and the rest was organic. That week resulted in # of shares and retweets as well as # of comments on the social media and # of comments on the site. You also want to look at per post as well. So my best blog post had 400 unique visits, 20% from Facebook, etc and my worst blog post (in terms of numbers) had 100 unique visits, 0% from Facebook, etc. Based on these numbers I will now set targets for 2014. I also look at my call to action, internal links and what sales I can attribute to each blog posts. I use tracking such as URL shortners in blog posts as well as just asking customers where did you hear about us? and why did you buy from us? to help attribute sales. I will also set leads, prospects and sales targets for my blog posts. I also try to figure what made my best post so successful and what I can do better based on my “worst” blog post. Your fifth and final objective is to set goals and achieve them. 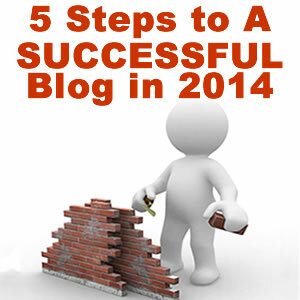 Start planning your 2014 blogging today and I hope you have a successful 2014.